Sherpa Power Peach Ginger Green Tea is made with tea grown at Kanchenjunga Tea Estate & Research Centre (KTE) in Eastern Nepal. Situated in the lap of Mount Kanchenjunga, the third highest peak in the world, KTE came together more than 30 years ago as a cooperative of 100+ local farmers in the region. Today, the tea garden thrives as a model for successful sustainable agriculture. In the name of development, the Nepali government is pushing farmers to use chemical fertilizers and insecticides, which comes at a great cost to the health of the soil and environment—as well as the farmers themselves. “The food is being polluted,” says Deepak Prakash Baskota, Chairman of KTE. This is why the local farmers of KTE came together to start a tea garden that would change the norms in agriculture and get back to a more natural use of the land. Unlike other tea estates that have only converted to organic after operating for years with chemical and synthetic insecticides, KTE has remained organic since its inception in 1984. Today, KTE is the only certified organic tea garden in Nepal. All you have to do is sip a cup of KTE tea to appreciate the difference that the regenerative organic growing process makes- better flavor, better aroma, and the palpable benefits of micronutrients and antioxidants. It is well-known that green tea is incredibly beneficial for human health, as it provides essential antioxidants to the body’s immune system. The level of antioxidants in KTE’s green tea is shown to be higher than in tea from any other source. It also has a lower caffeine content than other green teas, keeping it at a healthy level for the body. These differences in quality are likely due in large part to the soil of the KTE tea garden, which is exceptionally high in organic matter—9%, as opposed to the typical 4-5% organic matter found in most soil in the region. Farmers supplement the nutrients of the soil with other plant species—like neem, which produces nitrogen and acts as a natural insecticide, and vetiver, which helps control soil erosion and also provides an extra source of income to farmers. The cooperative model of the business means that local farmers get involved by contributing what they can—be it land, funding, knowledge, or labor. That collective nature has grown over the years to include further education in agricultural techniques, with KTE providing training in concepts such as composting, Integrated Pest Management (IPM), and environmental protection. This model of business is very attractive to Nepali farmers, who can expand their knowledge and create more income for themselves and their families. The tea grown at KTE not only has great health benefits to you, but your purchase of it through Global Family Farms also benefits KTE by making the tea available to a global market. 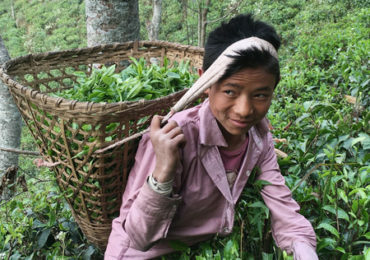 This means that the farmers involved in the tea garden are supported, and more farmers in Nepal are able to join the collective. Ultimately, the partnership between you, Global Family Farms, and KTE promotes the benefits of organic, sustainable farming in Nepal and all across the world.